On Friday afternoon the Whalers had 8 players and no opposition. 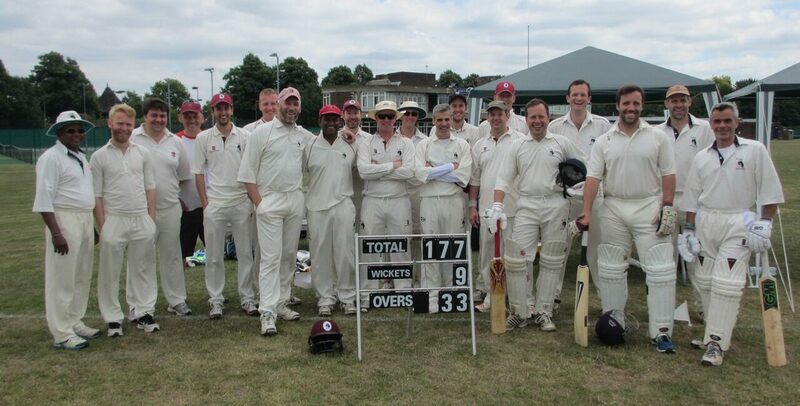 It was therefore a pleasant surprise that as a consequence of about 3 different cancellations between London and Oxford and some considerable faffing we ended up with an almost full team on Sunday against old foes Salix. Will Humphreys was selected on debut for the Whalers and thanks to Tony Fletcher from Salix for guesting for us. Nick was captain for the day and immediately distinguished himself by not tossing at all and somehow we were bowling. Khalil and unusually Kamal opened the bowling and it proved a decent plan as both were economical. The Salix openers Siv and Lamont were solid though, and became more confident with time at the crease with Siv especially proficient at dispatching anything slightly wide through the covers. The change bowling of Geoff and Peter also failed to yield any wickets before drinks where Salix were handily placed at 77 without loss. After the break Nick brought himself on and finally made the breakthrough with a fine ball to dismiss Siv for 41 and then Lumsden caught behind by Dan for a duck 2 balls later. The dismissal of Lamont shortly afterwards by Peter in the middle of an excellent spell and Whalers were right back in the game.However some careful batting by CK1 and some big hits by Padders (which damaged Geoff’s net sixes ratio) swung the balance back to Salix before a cluster of wickets at the death. A fine caught and bowled from Khalil and a last ball run out from Dan kept Salix to 175-6 which seemed about par on a good pitch with a huge outfield. The Whalers had fought well to restrict the runs especially early on when wickets were hard to come by. Nick took 2-39, Peter Cooper the pick with 1-25. After a quiet tea watching the Wimbledon final James Gould on season debut opened with Will Humphreys. It all started well with both looking comfortable until Will missed a straight one and was given out lbw for 9. Peter Cooper joined Gouldy and both scored well to put us ahead of the rate with Peter finding the boundary regularly as a couple of chances went down. The pair added 98 before Peter was well caught at square leg for a jug avoiding 49 and Jimmy was out shortly afterwards also out caught for 49. With some work still to be done Al started solidly and then managed to find some gaps in the field but less often the boundary with plenty of running including an all run 4. Dan was bowled for 2 and Khalil very well caught behind for a duck leaving Tony to deliver the final blow against his own club. However Al managed to steal the strike and all the scoring finishing with 51 not out from 60 runs scored when he was at the crease as the Whalers won by 5 wickets with a couple of overs to spare. Another solid all round performance from the Whalers. A pleasure as always to play against Salix and we look forward to the final part of the 2016 trilogy at Harlington next week. Muppet: Al and Dan’s running. Yes, no, f&ck before comfortably completing a run. This entry was posted in Uncategorized on July 11, 2016 by whalers1.